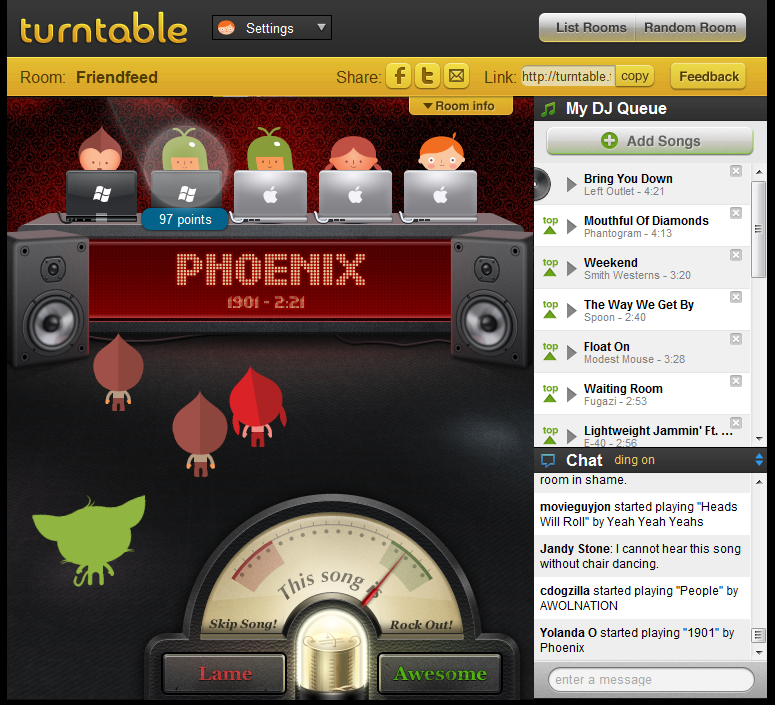 Thanks to Friendfeed's Jimminy I've been hanging out in the Friendfeed room at Turntable.fm and absolutely grooving it. This is an outstanding service if you've got friends who are always turning you on to great music but you're not exchanging mix CDs or getting as many tips as you'd like by just trolling their Facebook posts. You need to have a Facebook friend already in the service to get invited, but that shouldn't be too hard for most folks. It's got quick access to last.fm, twitter, and (of course) Facebook for sharing what you're playing and summoning your friends to the room you're in. Highly recommend you check it out. Thank me later. I'm dying to set up a room for some of my college buddies. I have a feeling they'll have to do a bit of uploading, but I've been pleasantly surprised by how many songs I was able to just select while building a playlist. I think I only had to upload two or three tracks, and one of those was a local band I'd have been surprised if they'd had. I should mention that it's U.S. only at this point. A bit of a drag because I've got a friend in England that would've rocked the room. I need to check out turntable. I've read a lot about it but haven't had time to explore it.